Success! The weather cooperated and we wound up with a sunny (even reasonably warm) day for my birthday picnic in the park. Since we had to carry everything with us I didn't go all out the details, but I created a simple logo and applied it to a number of the elements you see below, like the cups, napkin wraps and labels. 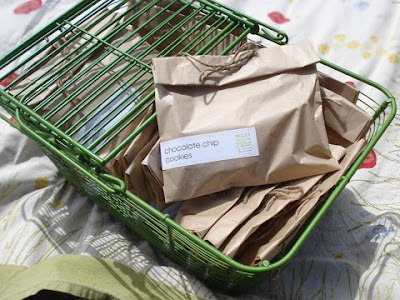 The menu included sandwiches (pb&j and turkey & havarti) wrapped in parchment paper, labeled and tied with twine, juice, chips and home baked chocolate chip cookies that doubled as the favors. We even made extra favor bags of dog cookies for our furry friends. Our guests contributed an amazing spread of salads, desserts and other delights and we wasted away the afternoon lounging on picnic blankets, watching the kids play and listening to the local color (which started as 3 guys playing drums and culminated into a mob of hippies, instruments and dancing in the meadow across the way). To round off the afternoon, the guys played a game of Bacci ball while some of the girls took the kids for a ride on the carousel (okay, so maybe that part was more for me than for the kids). I really couldn't have asked for a better day and perfect close to my 'birthweek' festivities. looks like fun! i love your yellow and green baskets! Love all the packaging! Fantastic job - glad the weather cooperated! Happy Bday! looks like you had a fab day!!! THANK YOU for including a great pump shot. You look awesome...tiny with your baby bump. Happy B-day. Wow, I remember your 21...scary that we are at 31! Ha. happy birthday! 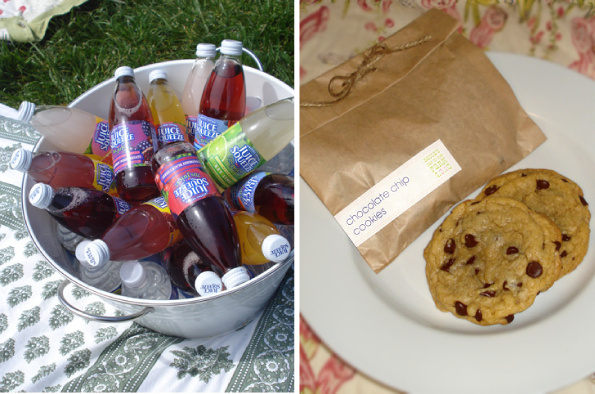 sometimes, the simplest of ideas are the best and a picnic in the park sounds awesome. hope you had a great celebration! 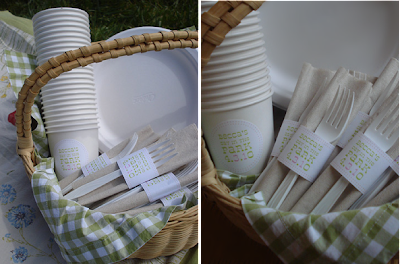 love outdoor picnics & all your packaging details were simply perfect! Happy Belated!!! And I just love the spread you made for your picnic!!! 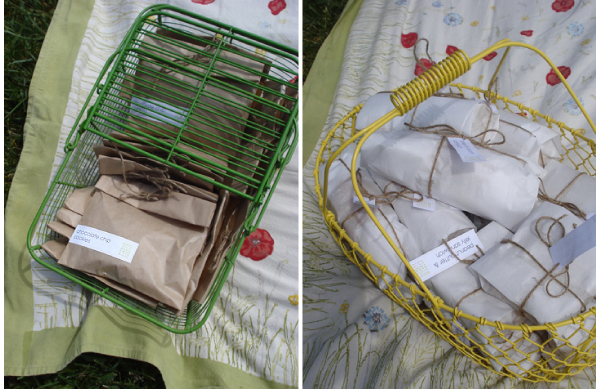 Great picnic - love the packaging..and basket!! 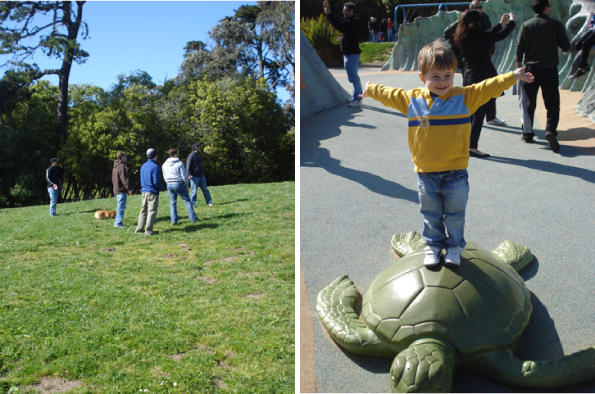 Bocce ball is so fun, eh? Did you get to play? 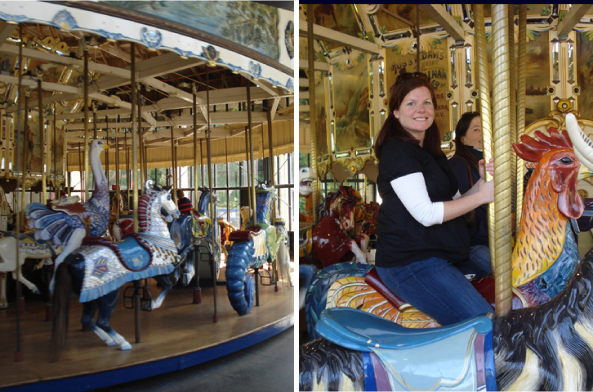 We did a book club picnic last summer; it was tough to carry everything, but it was so worth it. Check our my pics on my blog here. Love the packaging for the picnic in the park.